Long before the phrase What Would Jesus Do? (WWJD) became popular as a motto inscribed on bracelets, a young teacher of religious education and of skills for students with special needs in Lincolnshire, England, began to ask himself how would Jesus teach the topics he was teaching to these students. He was Roy Pitcher and, although he was probably not wearing a bracelet with the motto HWJT, he started on a search that he tells us has lasted over 40 years – so far! 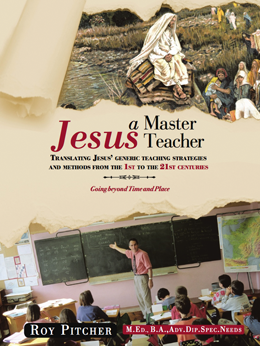 The book Jesus – A Master Teacher is the product of those 40-plus years of reflection as a teacher and teacher-educator. The sub-title of the book is Translating Jesus’ Generic Teaching Strategies and Methods from the 1st to the 21st Centuries and this very succinctly expresses the author’s aim. The book is divided into three parts. Part A is entitled ‘Illustrating the master teacher’ and looks at the origins and cultural roots of Jesus’ approach to teaching and concludes with a chapter-by-chapter study of Matthew’s Gospel that focuses on the teaching styles of Jesus. Part B looks at Jesus’ teaching styles from the perspective of contemporary social psychology and discusses the topics of leadership, perception, motivation, memory, socialization, cognition and emotions. It concludes with another chapter-by-chapter study focusing on Jesus’ teaching style, this time from John’s Gospel. Part C is entitled ‘Making it happen today’ and goes into more detail on eight of Jesus’ teaching strategies and on how spirituality can be taught through these strategies. It contains the third of three chapter-by-chapter study of Jesus’ teaching style, this time from Luke’s Gospel. A brief appendix to the book discusses personality factors and invites the reader to identify from a long list those that apply to Jesus. Then follows an extensive bibliography, helpfully sub-divided into titles that relate to each of the 18 chapters of the book and to the introduction and appendix. There is also a helpful index at the end. This is, in many ways, a unique book, dealing as it does in such amazing detail with teaching styles, methods and strategies and relating them to Jesus as a teacher and illustrating them in such chapter-by-chapter detail from each of three of the four Gospels. Almost every one of its 269 pages also has a challenging question at the bottom. It is replete with diagrams and suggested activities for the classroom. Such detail means that it is not a book to read through but rather one to dip into and find ideas to take time over and reflect upon. I found the many charts, tables and lists with bullet points a little off-putting but perhaps that is because I am more a big-picture person than one for detail. To be fair to Roy Pitcher as author, this is a possibility of which he is aware and he invites readers like me to “bypass the bullets and tables and see what remains that will enhance the everyday” (p. v). I also found the number of typographical errors off-putting but this is probably because I have spent too many years in an editor’s chair! There is a question about the validity of any exercise that seeks, as this book does and as many of us seek to do as we take Jesus as a model teacher, to translate his teaching strategies, styles or methods into our twenty-first century context. The author is aware of this and he refers briefly to a disagreement about this between two eminent philosophers of education (Nicholas Burbules and the late and much-missed Terry McLaughlin). This was published as the first two chapters of a book entitled Spirituality and Ethics in Education: Philosophical, Theological and Radical Perspectives edited by Hanan Alexander. The text of Burbules’ chapter (‘Jesus as a Teacher’) is freely downloadable from the website of the University of Illinois at http://faculty.education.illinois.edu/burbules/papers/jesus.htm but, sadly, McLaughlin’s characteristically gracious and carefully nuanced reply (‘Nicholas Burbules on Jesus as a Teacher’) does not seem to be available without purchasing or borrowing the book. In his chapter, McLaughlin makes a distinction between ‘exegesis’ and ‘appropriation’ which I think could be very helpful to all of us who ask how would Jesus teach our subject in our classroom to our students. ‘Exegesis’ in the context of studying Jesus as teacher is defined by McLaughlin as “involving an attempt to offer an account which, as far as possible, provides a full an accurate depiction of … the original ‘realities’ involved”. He defines “the contrasting activity of ‘appropriation’” in a way that he says is not intended to have negative connotations as “involving an attempt to offer an account of Jesus as teacher where the criteria for adequacy of the account are not primarily related to the extent to which the original ‘realities’ have been faithfully depicted, but to the extent to which Jesus as a teacher has been ‘brought alive for’ and applied fruitfully to particular persons or situations”. Turning to Burbules’ study of Jesus as teacher, McLaughlin finds it to be primarily appropriation rather than exegesis. That in itself is not a problem but what McLaughlin questions is Burbules’ “explicit pursuit of a secularised interpretation of Jesus” by setting aside his religious teaching and presenting him in secularised terms as a moral teacher. This leads to a view of teaching that is harmonious with, and attractive to, contemporary approaches to education but inadequate as an account of Jesus the teacher. McLaughlin argues for “a fuller and more complex picture of Jesus as teacher” which “raises questions about the extent to which his (Burbules’) ‘appropriation’ is devoid of elements of distortion”. In his brief reference to this discussion, Roy Pitcher says that his own approach follows that of Burbules rather than McLaughlin. However, I think he is in fact much closer to McLaughlin than he seems to think. For example, he positively endorses a didactic approach in teaching spirituality as being one of Jesus’ strategies (pp.194-5). This contrasts sharply with Burbules’ presentation of Jesus as a moral teacher whose teaching was “almost entirely devoid of explicit moral directives”. He also shows awareness of how the big picture of reality, human beings and God that we have makes a difference to our theoretical approaches as, for example, when he writes (regarding motivation), “whilst Jesus would not have denied crucial elements in the findings of Maslow, Murray and Rath etc. he could not have shared their view of man because Jesus envisaged the basis of motivation to be God the Father” (p. 99). I have given space to this discussion of exegesis and appropriation because I think that, in reading a book like this or in our own attempts to follow Jesus as a model teacher, we should be aware of the possibility of appropriation in a way that distorts the realities that exegesis seeks to uncover. We should also be aware of the views of God, his world and human nature that underlie contemporary approaches to educational psychology and philosophy and look for the extent to which they resonate or clash with a Christian world-and-life-view. There is much of interest and value in Jesus – a Master Teacher for any Christian teacher who asks how Jesus would teach in her classroom and much to learn from the master teacher himself through the fruits of Roy Pitcher’s forty-plus years of reflection. The aim of this comprehensive and detailed book is to translate Jesus’ generic teaching strategies and methods from the first to the twenty-first century, designing a meaningful transition to support today’s teachers. The text is divided into three sections, each concluding with an in-depth chapter-by-chapter biblical study of a gospel which examines Christ’s teaching methods in the light of the section’s foregoing thoughts. It is a cornucopia of text, diagrams, illustrations, suggested activities and question challenges, with each point considered in depth and great detail. Section A, ‘Illustrating the master teacher’, analyses teaching styles derived from Christ’s historical roots and his understanding of the social and historical context of the people he taught. It contrasts Jesus’ style of communication (personal, creating trust) with that of the authorities (didactic and authoritarian). Jesus, for example, was relevant, he was motivated, and what he said was contextually meaningful, rooted in the authority of tradition and based on a personal ability which carried authority. Section B, which seemed the least convincing of the main sections, examines the social psychology of Jesus’ teaching style, including leadership, perception, motivation, memory, cognition, creativity and problem solving. The final section, ‘Making it happen today’ suggests teaching strategies and a consideration of spirituality which can be derived from what has been considered throughout the previous two sections of the book. The wealth of detail, knowledge of social and developmental psychology and understanding of education theory is beyond question. However, in the rapidly moving world of education, neuroscience and psychology, books can date very quickly. ALS and VAK, for example, have been largely abandoned in contemporary practice; AT1 and AT2 have been consigned to the archive, Maslow’s theory of needs has recently been discredited by fellow psychologists and new thinking on the psychology of intrinsic versus extrinsic motivation and value-driven learning is currently emerging which redefines the work of earlier psychologists. The way that the aim of this book is achieved does create a central tension. There is, of course, much to learn from Jesus as a master teacher, but defining Jesus as goal-oriented and his work with the disciples in terms of process and product goals, SMART targets and mastery learning seems like trying to retro-fit Christ into contemporary models or trying to anaylse God using human measures. Mapping Jesus onto contemporary philosophies and pedagogy doesn’t, for me, really work. This is reinforced by phrases such as: ‘this is not suggesting that Jesus had a precise, technical understanding of leadership (or teaching) methods, but it does appear that he intuitively used generic methods that we now regard as modern’, ‘He had total confidence in his own world-view’ and ‘It is surprising how “normal” Jesus teaching was … and how supremely well it was done.’ This seems to lose sight of the fact that as equal with God, Jesus created all knowledge. It therefore follows that modern leadership and teaching methods have been derived from this knowledge, so it is not really surprising that, as the originator of human knowledge, Jesus showed such a good understanding of the methods which we have subsequently structured. And of course he had total confidence in his own world view – it is, after all, his world. This is, maybe, a book to dip into for regular reflection, rather than one to read from cover to cover: the number of overarching themes and their subdivisions can sometimes be tricky to keep track of, and the detail can, at times, be overwhelming. It is, by its very nature, a theoretical and philosophical text, not a ‘how to do it’ manual when struggling every day with levels, testing, targets and impending performance related pay. It does have a role, however, in encouraging readers to reflect on what sort of teachers they are or want to become, particularly if, as Christians teachers, they want to explore the model of communication and relationship offered by Jesus.